Imagine attending a performance at the Theatre Royal, and you discover the object of your affection is sitting in a box to your right. You have no desire to make a spectacle of yourself by leaning out of your box to see who they are with, so you take out what appears to be a straight-barrel spyglass and point it at the stage. While it looks as if you are focusing your attention on the performance, the ingenious spyglass you are holding is allowing you to watch the people in the box to your right. Now you can stare to your heart’s content and no one will be the wiser. While researching a pair of antique opera glasses this past week, I stumbled across a fun accessory I’d never heard of, known as the “jealousy glass.” It looks like a single barrel opera or field-glass, but it actually contains an oblique lens and side aperture that allows the user to discretely see what is happening to their left or right. As time went on and the demand for jealousy glasses increased, innovations were made to Hevelius’s original design. The jealousy glass pictured above was made in France and dates from 1750-1770. It has a brass eyepiece and blue enamel casing with white decorative embellishments. 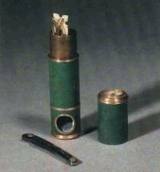 A hinged “lens cover” conceals a storage compartment that was probably used for snuff or a pomade. The oval mirror with a surrounding green cord opens to the side and allows the user to view the reflected image. Jealousy glasses were also designed with specific genders in mind. This jealousy glass is from England and was made in 1760. It was specifically designed for a gentleman and holds a number of accoutrements. The brass body is covered in green stained snakeskin, and there is a magnetic compass set into the brass cap. The core contains a gentleman’s manicure set and includes nail scissors, a hinged ivory note-slide, a pencil, folding knife, needle and tweezers with a file handle. It reminds me of an 18th century version of a Swiss Army Knife. 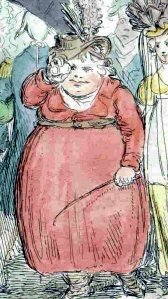 The ladies also had jealousy glasses created especially for them. This early 19th century jealousy glass was made in Paris by Bointaburet. It contains a pill case under the lid and a miniature scent bottle just 2cm wide that fits within the barrel. Should the behavior of a certain gentleman cause a lady to swoon, the bottle’s contents could help revive her. Thanks, Lori. I’m glad you enjoyed the post. I think high school kids could still need a jealousy glass. I hope u are planning on using it in your manuscript. It sounds like a humorous scene could be pulled off from your blog post. Thanks for sharing.